One of the best things about visiting (and working at!) the Chicago Botanic Garden: you get great ideas for your own garden. I put one of them to work in my new “all vegetable” front yard garden this weekend. 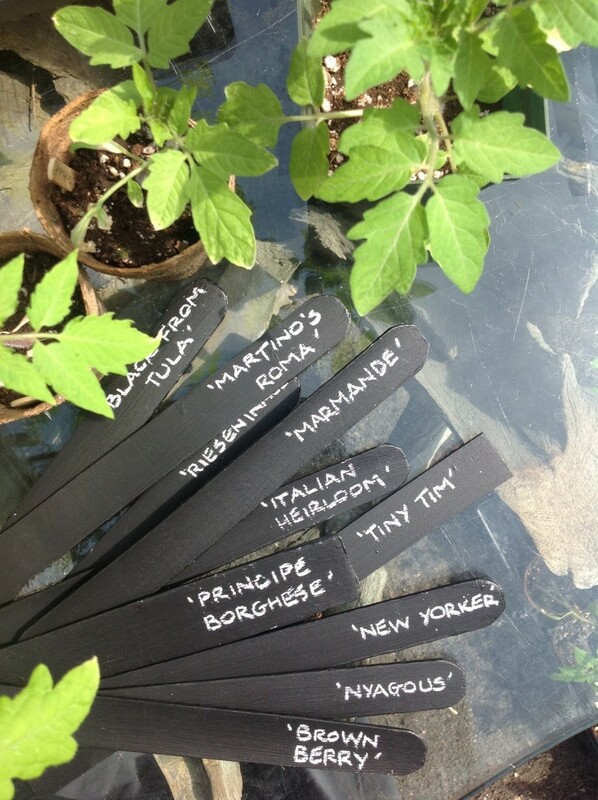 Last summer, at the Heirloom Tomato Weekend, horticulture program specialist Nancy Clifton faced the challenge of labeling dozens of different heirloom tomato varieties in containers. 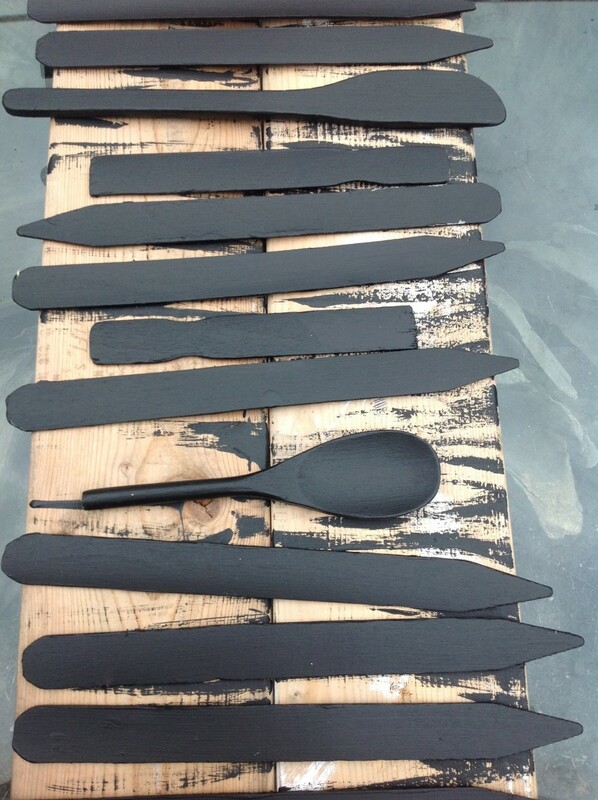 Her solution was simple and elegant: gather up the paint stirrers and get out the chalkboard paint! Before: Clean out the paint shelf! 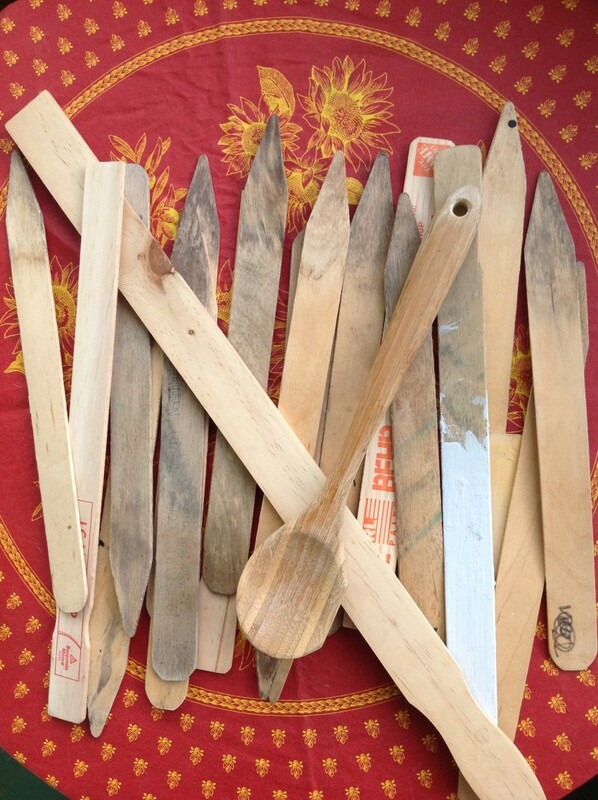 Old paint stirrers, stakes, and even wooden spoons work as plant markers. After: Two coats of chalkboard paint ought to do it. Tip: Looks better when you paint the sides, too. The photos are testament to how easy it is: assemble a pile of paintable wooden markers-to-be, scrub-brush lightly under running water, and let dry. (No need to overdo it on the pre-cleaning—the paint covers most everything.) On a fine spring day, apply two coats of chalkboard paint. I went for black, but you can have the white base paint tinted any color. (Ooh! Lime green would have been good!) Let paint dry between coats. A pile of tomato markers await 50 degree-plus nights before the tomatoes can go in. To write the names, I used the same basic white grease pencil—found at any art store—that’s used on the metal signs at the Garden. It withstands rain, wind, and dirty hands. Like many gardeners, I’ve tried lots of different methods for labeling over the years: Popsicle sticks (disintegrate fast, get stepped on), zinc and copper markers (too small to read from a distance, get stepped on), and rocks (hard to keep in one spot). This approach is simple, recyclable, nice looking, and kind of fun to do—makes a good kid project, too! Posted on May 21, 2014 May 20, 2014 Author Karen Z.Categories Horticulture & Display Gardens, How-ToTags garden markers, gardening, gardening with kids, how-to, row markers6 Comments on Best. Plant labels. Ever.